I spent a day in the field yesterday looking for various micro species that we have not recorded recently. As is usually the case, I went out with a couple of targets in mind and came back with records for two completely different species. As it happens, both of these have not been recorded since the mid 1990's. 4.068 BF46 Trifurcula immundella is a stem miner in Broom. It mines from the tip of the twig downwards, sometimes turning round to head back up the twig. This species feeds over the winter and larvae have only recently left the mines. There is a potential confusion species - 256 Leucoptera spartifoliella. It usually mines towards the tip of the twig and pupates in a conspicuous white spinning attached close to the mine. These mines were found at the Beacon Road car park on the Malvern Hills. 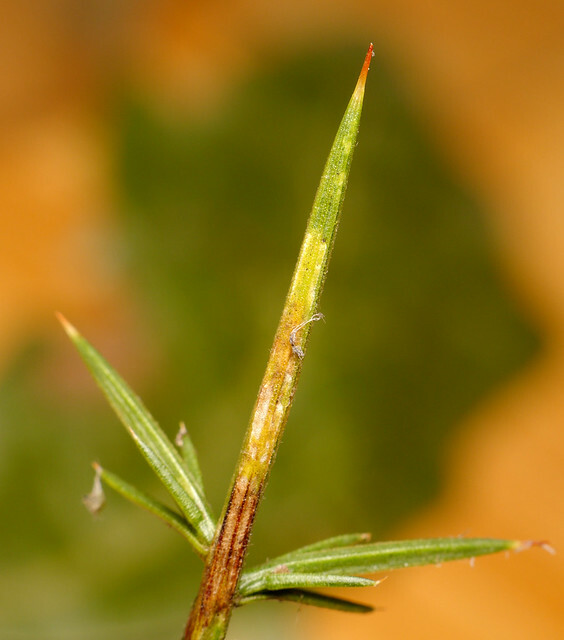 15.060 BF339 Phyllonorycter ulicicolella mines stems and needles of Gorse. 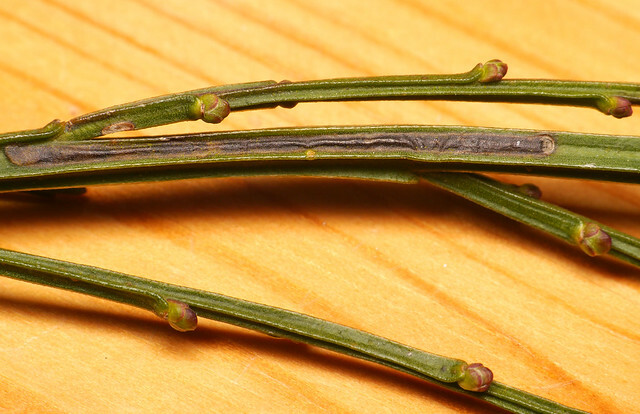 Mines in the stems are difficult to spot and painful to inspect! When they are in a needle it is somewhat easier to see them. I found this one on the Old Hills. Both of these species are almost certainly under recorded and are probably more widespread than the records suggest. I spent an hour inspecting gorse on Walton Hill (Clent) yesterday to no avail (hard work! ).